I have an idea to drive induction motors in a new way. I call it Variable Torque Drive (VTD). You are all familiar with VFD which utilize variable frequency and try to keep the torque constant. This method is vice versa. Let me explain. Assume I have this weird delta configuration to drive phase coils. 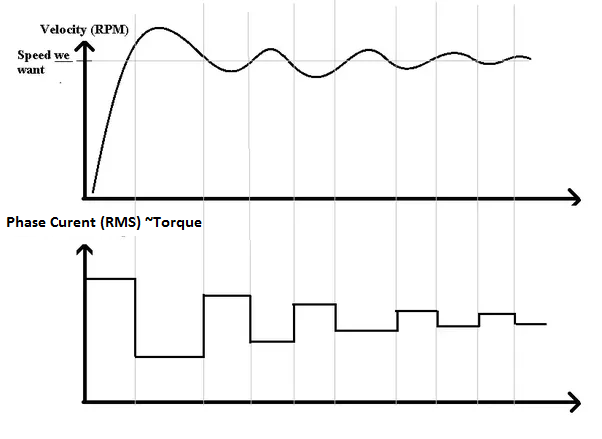 Keep in mind that I can control the drive currents RMS amplitude like in the figure, on right. For some reason I can not change the frequency, but I have full control over the amplitude. You are seing the waveform of each phase currents in the figure. 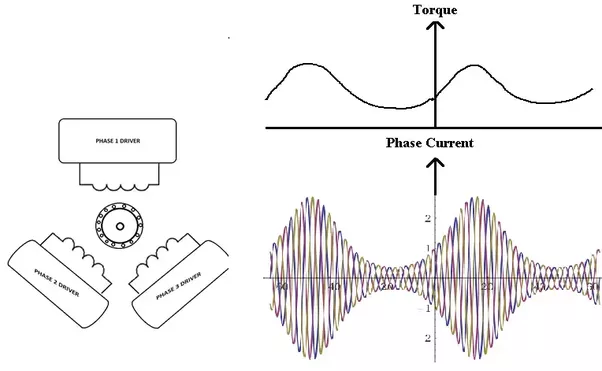 As you know IF you increase the phase currents you increase the torque. Now lets assume I have a constant frequency at 100 Hz and I can deliver 0 to 100 Amps RMS currents. Please try to put aside what you already know about classical driving methods. Like I said, I have full control over the amplitude and If I don't allow current flow on field coilds, no currents will flow. So since I can drive field coils at 100 Hz, its synchronous speed is 100*60 = 6000 RPM max. Now lets say I want to drive a loaded motor in 10 rad/s. Load is 10 KN and I can deliver up to 20 KN to the load. I also have speed sensors in on the rotor side. First I will deliver 15 KN to the load, and when I reach some speed close to 10 rad/s, I decrease delivered power to 5KN, then after the speed decreased down to some level below 10 rad/s, then I increase it to 12 KN, then 8 KN and it goes and on like this till I adequately regulate the speed at 10 rad/s. See the figure below to understand it better. The question is, since my synchronous speed is 6000 RPM, can I drive an induction motor with this method and control the speed 0 to 5880 RPM(I figured the slip may be 2%). If so, does such method exist? If not, please explain why. Thanks. In the last 25 years there has been an enormous amount of evolution and technology that has gone into controlling 3 phase Variable Frequency Drives. Discussing any details around how to do it in a new method or better exceeds the scope of a forum such as this, but would be a good basis for a PHD thesis. A good starting point in your study is Vector mode control, which is typically one of 3 standards modes to run an off the shelf VFD drive in. Constant Torque is a standard mode in most VFDs - BUT if you are talking a 50 or 60 hz motor - why would you choose to run at 100 hz UNLESS you had a reduction in torque requirement in your 60 hz - 100 hz range. In my experience every 3 phase motor rated at a base speed of 60 hz has a reduction in torque capability for speeds above 60 hz. 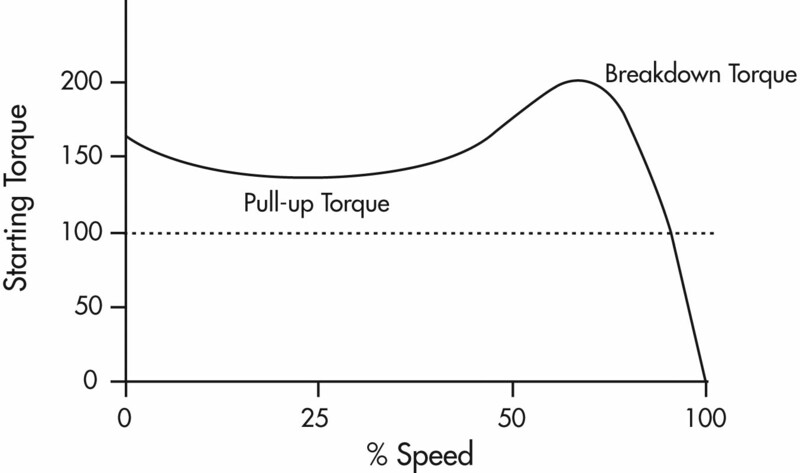 You will also want to do some reading and study the Pull up torque curve which has been a staple in motor theory and motor manuals for 75 years. If you get a good grasp for how Vector control modes manipulate this Torque curve at various speeds - you will have a foundation to start with. The speed of an induction motor can only be controlled by changing the synchronous speed by changing the frequency of the supplied power or by changing the motor slip. The method that you have described is a means of changing the motor slip. The majority of the heat produced in an induction motor is heat produced in the rotor due to slip. The heat produced in the rotor is the slip percentage multiplied by the power transferred from the stator to the rotor. That is the reason that controlling the speed using that method has only limited use, primarily for controlling the speed of small fans. Not the answer you're looking for? Browse other questions tagged motor analog power-electronics induction-motor vfd or ask your own question. Can I monitor 25A peak to peak sinusoidal current wave precisely with this Hall-Effect Sensor? V/f Constant control for single phase induction motor? How to determine full-load RPM of an induction motor at any arbitrary frequency? What is the recommended way for starting an ac induction motor with a VFD?